The education given to Flora Poste by her parents had been too expensive, too full of team sports, and too long. So when they died of a sudden illness within a few weeks of each other, during her twentieth year, Flora was discovered to possess every skill except that of earning enough to live on. Flora, orphaned unexpectedly at 19 and left with little inheritance and no suitable skills for finding a career, decides to write to all her existing relatives to see if anyone will take her in. She is determined to find a strain of her family that needs her to supervise them and change their lifestyle. Flora receives a cryptic letter from Judith Starkadder, who has expected to hear from Flora for years. A great wrong happened to her father years ago and now Judith feels that they should put it right by taking his daughter in to live with them. Flora arrives at Cold Comfort Farm in Sussex and begins to alter the lives of the rather eccentric characters living there. Within weeks she has turned the household round and set them all free from the aunt who controls everyone in the household from high up in her locked room. Oh how I loved this book and I have to say a big thank you to Ana for bringing it to my attention last December. I was enthralled by this book from page one, it was such a delightful read. Flora is a fantastic lead character within the book and she came across as a cross between Mary Poppins and Nanny McPhee as she carefully evaluates what each family member needs in order to turn their lives around. I can almost see Flora with a magic wand in her hand, waving it over each character, like a fairy godmother and solving each of their problems with ease. To get a better picture of Flora, here is a quote that describes the way she thinks. Aunt Ada Doom is a blast. She has convinced the whole family that she is mad and they are too frightened to go against her. She rules the house and every one's finances from her ivory tower and only graces them with her presence once in a blue moon. Her whole madness revolves around one small event in time, 'when she saw something nasty in the woodshed.' Yet Flora soon takes her to hand and even manages to change Aunt Ada's life for the better too. This wonderful book is a book of parodies, basically sending up a collection of our most classical fiction. Wuthering Heights is the book that it sends up the most, with the sister of the household Elfine resembling Cathy on the lonely moors. Although this is difficult for me to actually see at the moment, as I am only up to chapter six in Wuthering Heights. Also I believe that Aunt Ada Doom is a bit of a take off of a Mrs Rochester in Jane Eyre. Two followup books were written about Cold Comfort Farm. The first one 'Christmas at Cold Comfort Farm' is a set of short stories which prequel the arrival of Flora at Cold Comfort Farm. 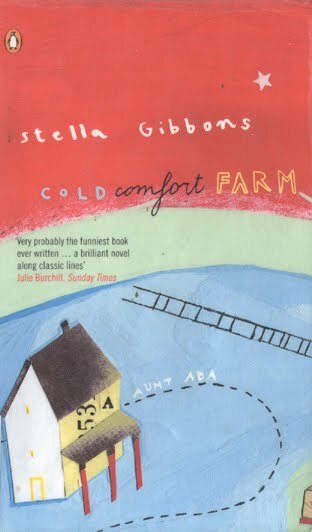 The second book 'Conference at Cold Comfort Farm' is a sequel to the book I read and occurs sixteen years after the first one. In Ana's review over at Things Mean Alot, she mentioned that someone had suggested to her that Cold Comfort Farm held similarities to I Capture the Castle by Dodi Smith. I could understand the connection, as I could feel a similar magical quality to both books. It is hard to explain, but each one has an air of fairytale to it and I would describe both as magical books to read. This is a fabulous book full of hilarity and magic. It is a relatively short read and a definite must for anyone who loves a happy ending. You know, it's funny: after finally reading it I began to disagree about the similarities :P I see your point (and the point of the people who mentioned them together to me), but I think Nightingale Wood is actually more I Capture the Castle-ish. Anyway, I'm so glad you loved this, Vivienne! Flora IS a bit like Mary Poppins, lol. And I actually and forgotten about those sequels...I wonder if they'd be easy to find. And who doesn't love a happy ending? You could tell all the way through the post just how much you had enjoyed this book. Library here I come. Viv, this sounds like a book I would love. I love parodies. Thanks for making me aware of this book. For some reason I never thought about getting this book, but recently a friend of mine read one of my short stories and told me it reminded her a lot of Cold Comfort Farm. That makes me a little more intrigued. Vivienne, what a wonderful review! I will add this to my wish list:) Thanks so much! I imagine Ana is responsible for a lot of book purchases that are made. This book sounds delightful! That sounds wonderful! Going on the library list for sure. I don't think I would have been drawn to the book by the title alone (it really doesn't give a clue what the book is about to my mind). It sounds like a lot of fun to read though. Oh, I will be adding this to my TBR list. Definitely. Thanks, Vivienne, and Ana. This is one of those books I've been meaning to read for ages! I didn't realize there were some sequels either. A friend of mine recently sent me a DVD of Cold Comfort Farm but I think I want to read the book first. Funny that I should find a review of this one on your blog today as the movie was just on tv earlier. I couldn't get into the movie but then I wasn't really concentrating on it either. The book sounds like it would be a much better bet for me. Glad you liked it. I just read this one and loved it. It is going on my Top 10 list for sure. Here is my review on Rose City Reader. If you would like me to list your review on mine, please leave a comment on my review with a link. I always like to ask first, but I don't always remember to come back and to find a response. But a comment on my post will get my attention. I found your blog last week through the blog hop and signed up as a follower. i adored this book. i adored everything about it. that is a beautifully written review. Flora does sound like an interesting character. This DOES sound good. My interest was piqued with Nymeth's review, and now that I've read your review, I'm pretty much sold!